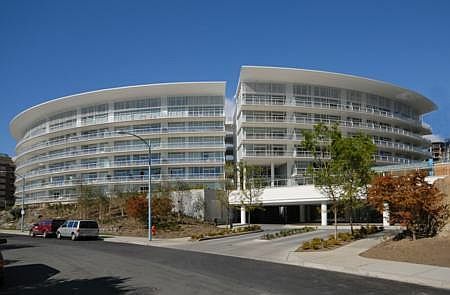 Our unit is located in the quiet Songhees area in Esquimalt, a suburb to Victoria, BC, was just completed August 2007. It boasts 275cm high floor to ceiling glass windows with a 2m wide and 10m long balcony with entrances from the living room and bedroom. Watch sea planes and boats enter the harbor from our balcony while BBQ your favourite dead animal (SMILE) and drink some cold beers or some wine perhaps. If it’s too chilly on the huge balcony, why not move inside, in front of the fireplace. The Kitchen is quite nice with new stainless steal appliances and granite counter tops. The Master bedroom is equipped with a King Size bed, en suite bathroom with huge shower and a deep soaker tub. Granite counter tops is seen around the sink. The Den (Guest room and Office for me) has a separate washroom and also 275cm high windows and harmonizing views! In the building we also have some nice “treats” like a gym with all sorts of machines and equipment for any tenant to use. Not to mention the infinity pool seen on the first picture is marvelous, perfect for doing the laps during the summer months! After doing a few km’s in the pool, you can jump into one of the two hottubs, or why not sweat it out in either the dry sauna or the wet sauna? We have inner harbour views of Victoria from our 20 square-meter balcony which looks south / southwest. 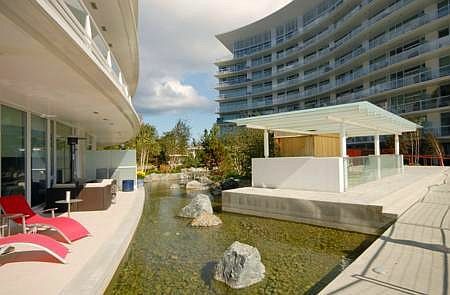 A water garden, lagoon, separates us from the “S” building which has a wonderful sitting area/viewing area. Wonderful sunsets can be seen a certain times of the year. The complex also offers us two lagoons with water features that makes this place a relaxing place to come home to every night. My XTerra can be parked safely in the underground gated parking. From Songhees Rd to Downtown (Intersection of Government and Johnson) it’s 700m. For me to drive to Camosun College it’s 5.7km one way. I’m considering taking the bus as much as possible, and might even put my bike on the bus and bike home after school!